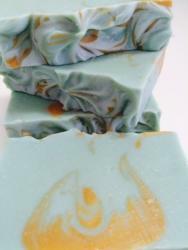 Scented with Blue Gum and Tea Tree essential oils, this soap is like holding a little piece of Australia in your hand. This soap is a gorgeous light teal with a gold swirl through it, reflecting Australia's tropical waters and vibrant skies rather than the more traditional green and gold. As a bonus the Blue Gum Eucalyptus and Tea Tree essential oils are highly antibacterial, making it excellent for troubled skin.